The itineraries traced by this book investigate the ontological and metaphysical sense of aesthetic experience. This latter is here understood as the primary experience through which our whole existence as human beings is endowed with the world and can manifest itself. Readers will find two different yet convergent intentions. The first, exquisitely concerned with ontology and aesthetics, develops Merleau-Ponty’s theory on flesh as element in the direction of an ontology of virtuality. Its main aim is to fully grasp a new entity surfacing on the background of being, which is, properly speaking, neither living nor artificial. The second, mainly concerned with aesthetics and metaphysics, pinpoints entities’ power of being within the aesthetic-linguistic experience of deixis while accounting for the work of the aesthetic logos as a condition of possibility for metaempirical inferences. Roberto Diodato is Professor of Aesthetics at the Catholic University of Milan. He is the author of many books, including Spinoza, Góngora, Vermeer. L’estetica come scienza intuitiva (Milan 1997; Paris 2015); L’arte come categoria estetica. Un’introduzione (Lugano 2005); Estetica dei media e della comunicazione (Bologna 2011, co-edited with A. Somaini); Logos estetico (Brescia 2012); Relazione e virtualità (Bologna 2013). 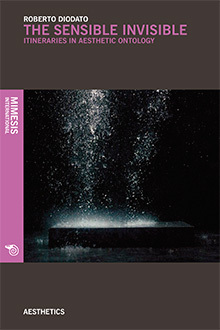 Mimesis has already published his work Sub specie aeternitatis. Luoghi dell’ontologia spinoziana (2011). In English he has also published the book Aesthetics of the Virtual (State University of New York Press, Albany, 2012).